The H1N1 flu virus has garnered a lot of media attention and has been a source of concern for many people, and rightly so. It has rapidly spread around the globe and has become pandemic. This particular flu has hit young and otherwise healthy people very hard. The H1N1 flu has also been a dangerous disease for pregnant women and those with underlying medical conditions. It is estimated that over five million people have contracted the virus in the United States and nearly 6000 people have died from it worldwide and the numbers are expected to rise. The H1N1 flu virus is currently the dominant flu virus circulating the world. Over 60 percent of all flu cases are caused by H1N1. It is prevalent today in North America, Europe, and Asia. Because of its prevalence, a special H1N1 vaccination was rushed into development and was made available to the public in the fall of 2009. There is much controversy surrounding the safety of the vaccination, especially among those who remember the swine flu outbreak and vaccine disaster of the 70s. Today, vaccine production is much safer and those in high risk groups are being encouraged to become vaccinated in order to avoid contracting this dangerous flu. 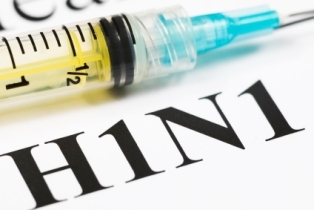 The H1N1 vaccine is administered either as a live virus in a nasal liquid or as an injection. Pregnant women should not take the live H1N1 vaccine, but opt for the injection instead. The H1N1 flu virus is spread in the same way other viruses are spread, through person to person contact. The virus is expelled in sneezes and coughs. Anyone coming into contact with the secretions could potentially become infected. The symptoms of H1N1 are much like the symptoms of any bad flu. You may feel fatigued; have a fever, cough, runny nose, sore throat, chills, body aches, and possibly vomiting and diarrhea. If you have these symptoms, you should stay home until you feel better so you do not infect other people. Symptoms of H1N1 flu that require emergency medical care include trouble breathing, rapid respirations, extreme irritability, becoming unresponsive, fever with a rash, chest pain, dizziness, confusion, and persistent vomiting. People who are at a high risk of complications from the H1N1 virus are children under two years of age, pregnant women, people with respiratory conditions like COPD or asthma, people with heart disease, those with weakened immune systems, and people with liver or kidney disorders. The treatment of H1N1 flu depends upon the individual and how ill they become. For most people, it is treated similarly to any other type of flu with bed rest and plenty of fluids. For those at high risk of complications or those with severe symptoms, antivirals may be given. The CDC recommends that anyone who is ill enough to be hospitalized with the H1N1 flu virus receive zanamivir (Relenza) or oseltamivir (Tamiflu.) The greatest benefit is obtained from antiviral medications when they are stated within 48 hours of becoming ill. The current strain of H1N1 is resistant to two other flu medications, amantadine and rimantadine, and it is possible the strain will mutate as it ages and become resistant to medications that can successfully treat it now. In fact, scientists expect it to mutate at some point. Relenza and Tamiflu will not prevent the spread of H1N1. They work to speed recovery and prevent the flu from developing into a serious medical condition in some people. They are more effective if taken in the first two days of illness but recent studies have shown they may also be beneficial if started later in the course of the disease. Both of these drugs are effective and carry a low risk of side effects. Relenza should not be used in children or pregnant women as it may cause seizures and the safety of this drug has not been established in these groups. Certain other groups need to use caution with Relenza. This includes those with lung disease or mental and mood problems. Relenza may trigger bronchospams and wheezing in people with asthma or COPD. The drug can also cause dizziness so you should not drive while taking it or operate dangerous machines. Relenza may also have undesired mental effects like increased confusion and unusual behavior. Tamiflu is sometimes given to high risk groups in order to prevent catching the flu but is more commonly given at the onset of H1N1 or other flu. The CDC recommends that you take the flu shot rather than relying upon Tamiflu to prevent or treat H1N1. People with brain disorders, that includes swelling of the brain, may not be able to take Tamiflu. Like Relenza, Tamiflu can cause sudden behavioral changes which include confusion, self injury, hallucinations, and bizarre behavior. Less serious side effects of Tamiflu are insomnia, dizziness, nosebleed, nausea, and headache. It is important to protect yourself from the H1N1 flu virus by practicing good hygiene. Be careful about shaking hands and wash your hands frequently or use hand sanitizer often. Select a hand sanitizer that is at least 60 percent alcohol. Take care of yourself. Get plenty of exercise and eat a healthy diet so your immune system stays strong. Avoid touching your eyes and mouth. That way if you do have the virus on your hands, it won't have an easy entry point into your body. If you do get ill, be careful not to spread your virus around because you could infect someone in a high risk group. Sneeze and cough into your sleeve. Stay home if you are feeling sick. Limit your contact with family members and try to stay at least six feet away from others. The CDC does not recommend the use of face masks in the home or community as a way to prevent the transmission of the H1N1 flu virus for most people. However high risk groups are encouraged to use them if they cannot avoid crowded groups or are a caregiver to someone with H1N1. For most people, the H1N1 virus will cause them to feel like they have a bad case of the flu for about a week. They will recover at home without special treatment. For others, the H1N1 flu can be deadly. That is why there is so much concern over this disease and why people are encouraged to get the vaccination and work hard to prevent its transmission. For an additional resource on H1N1 Flu Prevention, a page on a survival website I have partnered with offers 6 Recommendations for Preventing the Flu. See H1N1 Swine Flu Prevention for some unique content.